Overview picture. 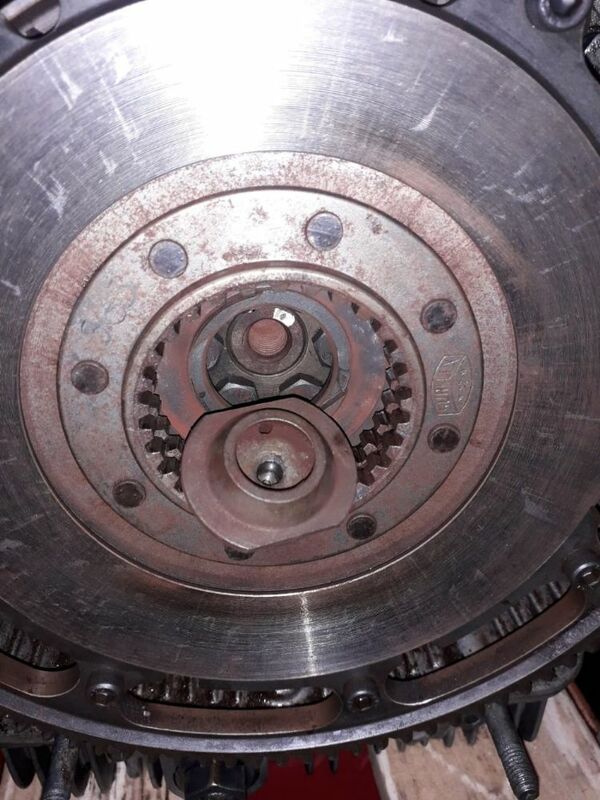 Its a Surflex clutch, thats all I can make out. Yup that's a special lightened jobbie. But looks like attachment to crank is standard. PS: the starter ring gear teeth look very worn, or they are meant to be that shape? Use new bolts for the crank, 10.8 tensile strength or more. Also new spring or schnor washers. 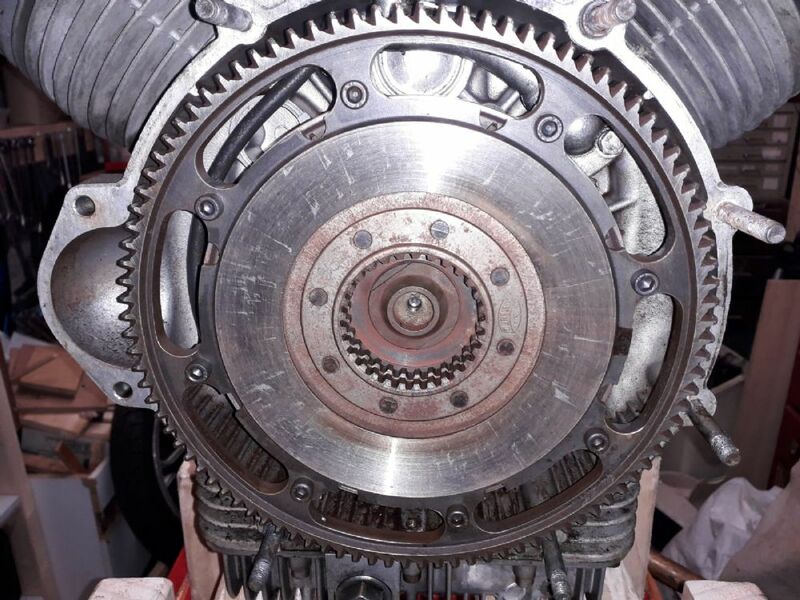 You can realign the clutch with the transmission sprocket with gearbox in hand for reassembly but it would be easier if you had a separate sprocket for that. Ring gear teeth will usually do even if they look worn. I guess removing burrs from the teeth won't do harm. The ring gear teeth usually have an odd lead in profile when new. Something to do with helping the pinion mesh more easily and quietly. This is the most important advice here. Everything else might underperform or fail awkwardly. The flywheel coming loose will fail catastrophically. 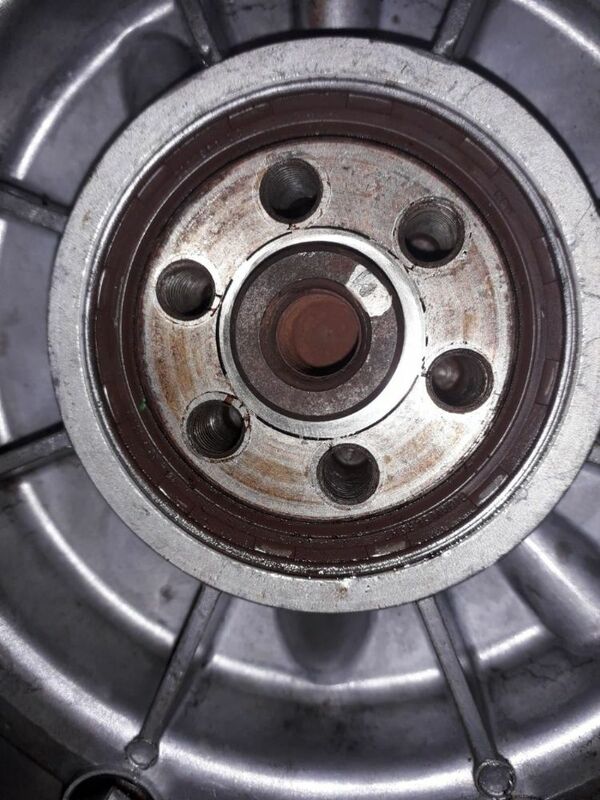 The flywheel bolts are going to be replaced definetly. On the first Le Mans I had when I did the clutch on that back in 1983, I used bolts thread right up to the head. They sheared off on the M11 near junction 8 on the way to France from East Yorkshire. AA relayed back home overnight. 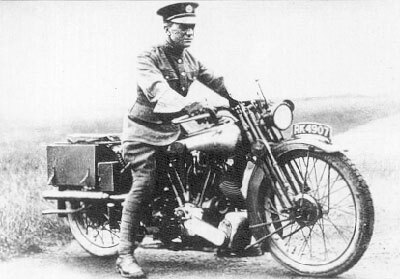 Got home at 0600, engine out, took it into work to the fitters on a sack barrow (no car). Bolts extracted, new bolts turned up with shoulders and locked wired in and set off again at 1600 the same day. Forgot to put a split pin in the footbrake pivot which I didn't find out till braking into a roundabout on the A1 near Peterborough, but a cable tie held it all the way to St Tropez and back. Have you verified that a porous engine casting didn't oil your clutch plates?? Happened to my Lemans IV not long after new. As for tools a pressure plate compression tool makes installing the new plates without accidently warping the plates on assembly much less likely. I made my own with a large bolt that threads right into the end of the crank with a nut and washers to compress the pressure plate while putting the clutch plates in. Also a stuck crankcase breather valve (a large ball bearing in a housing like a PCV valve) can stick when moisture blends with oil at this valve showing a milky brown goo around the ball. 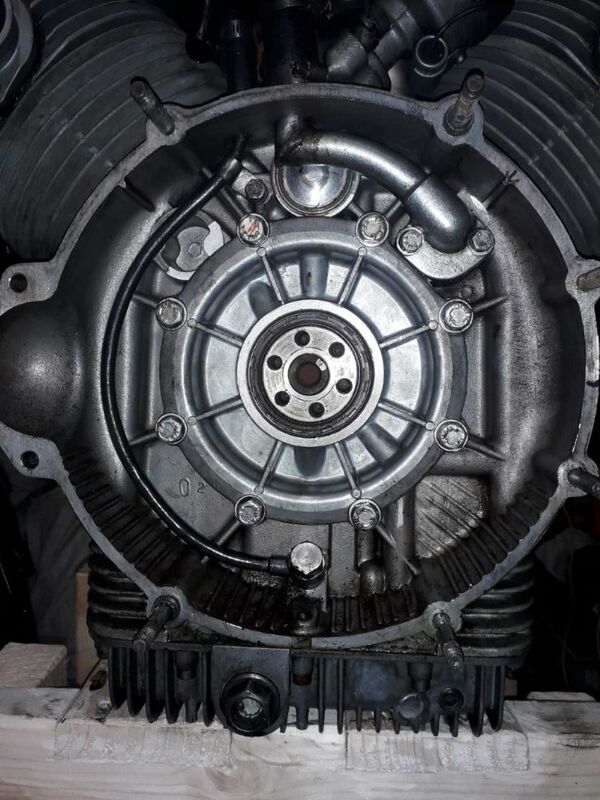 Result can be a belching of oil on the clutch plates from over pressure of the crankcase. Clutch is off and plates are oily. Don't think the oil is coming from the crankshaft oil seal, it's either the gasket of the breather to the top right, the returns at the top or the aluminiuminium washers at the bottom. Don't overlook the bearing carrier gasket, the two bottom bolts that communicate with the crankcase and should be loctited, and the camshaft blanking off plate that's been known to leak (it's only pressed in and sometimes requires a bead of sealant). The bolts normally have tab washers, torque is 3 mkg. I've had a leak past the Jubilee clip at the bottom of the big breather connection to the LM breather box. It dribbled down into the clutch housing and appeared at the bottom of the gearbox through the lever window. Looks terrible, five minute fix after three hours diagnosis of course. Had to remove the breather box to find out. The oil on the inside of the upper part of the breather pipe was the clue - and the split loose pipe.